In the 1983 Bongard Willi published his Pock and Balsa containing criteria of quality in the visual arts of the 20th C (Studio International UK, 1966:1001, Aug, 83, pp 28 – 31), e.g. mastery of artistic techniques, social commitment and continuity of artistic creation. Contemporary art appropriates what used to be not a part of artistic techniques, yet, at its best aims at the mastery of the new ones. Helga Griffiths uses scientific techniques to make immersive installations when she collects 100 years of weather reports, visualising them in Wavespace, 2009. The piece is a custom made square pool with black plastic lining filled with water, a 30sec video loop of footage I took in Lagan Meadows showing the reflection of sky and leaves on the river, an LCD projector positioned in such a way (using a stencil) that the pool becomes a screen as well as a reflector that magnifies and reproduces the image onto the wall, a large bag of water (replaced each day) letting drops fall into the pool which become magnified in the reflection on the wall. At the time of writing I failed to locate Mary Grimes or an image of her sculpture, yes, it was done under that category. Another artist working with a paradigm of everyday phenomena presented in unfamiliar way comes to mind. Deirdre McKenna. 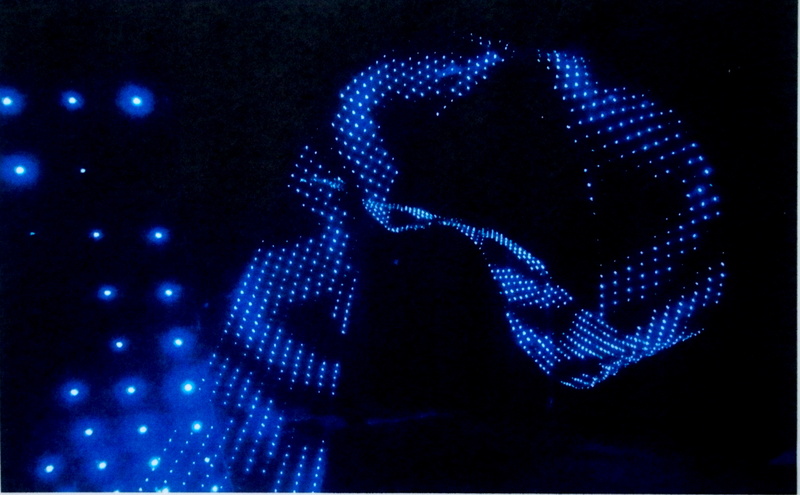 Her MFA show offered a dark room with light materialising two ‘objects’: A wall size illusion and a surprising small one above your shoulder formed Necessary Absence, 2007. Water, touch, sight, even hearing, share the ambitious aim of convincing lie rich in sensual delights and of forming a paradigm that constructs nature as indelible part of visual art with the use of modern materials and techniques. An immersive installation is usually a stationary indoors display of outside mobile reality. 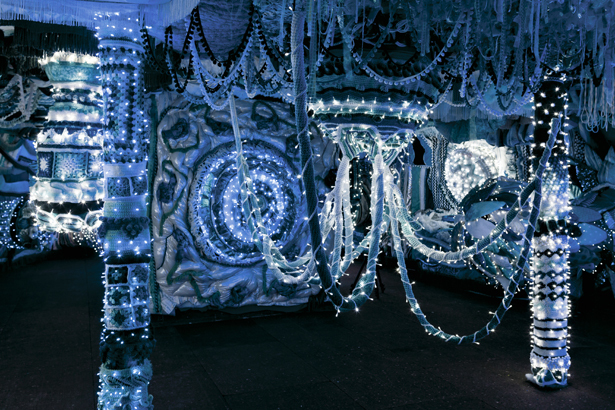 During the current Biennial, Joanna Vasconcelos sails a renovated ferry adorned with blue and white tiles and with suspended crocheting intertwined with LED lights on the deck around Venice lagoon at regular intervals. The installation having now both inside and outside. The staged, indoor environments with their fleeting flickering image and spotlights in an otherwise dark space were set up to visit, enter, view. John Robinson stressed the dissonance between real landscape / nature and and art landscape / nature straight at the door. A closed door carried the word Reflection in a confidently autonomous manner, the word standing on its own easily as a concept, not referring to a made object or special arrangement, or movement or light, or video footage. This could be what Turrell called learned perception – from numerous conceptual exhibitions of words as images. For a moment I thought – this is it. Then another visitor opened the door behind which was dark space, which lit up only on aligning seeing with the dripping water and the spinning video loop. The seeing embodies the immaterial projection and the dripping water as both equally real or projected until the hearing of the sound produced by the weeping leaking water introduces volume and mass, however minimal. From then on it is not two different natures, just one environment into which the entry is a closed door that you must open to get the sense of the place that differentiates it from other places. And that, you may recall is the classical definition of landscape. Present are Earth, Water, Fire and Air – believed by the classical Greek thinker to be the elements that make up the universe. And you and me – how much percentage of water are we made of? Everyday familiar turned into less familiar. An aesthetic experience free from learned perceptions. This entry was posted in article, review and tagged Damian Coyle, Deirdre McKenna, Helga Griffths, immersive installation, James Turrell, Joana Vasconcelos, landscape, Mary Grimes, nature, Venice Biennale 2013. Bookmark the permalink.